While the Margin property allows adding extra space around the outside of a control, within its container, the Padding property allows adding space within a control. The space is added inside the control, around its content. In the example below, we have three Button controls who are set to size to their content (which includes the padding). The first button uses a default padding of 0. 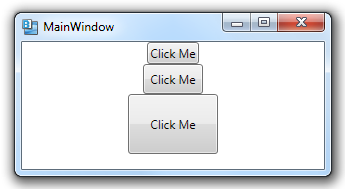 The second button uses a padding of 5 WPF units around each side and the third uses a padding of 20.